The Owyhee River is located near the Idaho border and starts just below the Owyhee Reservoir Dam. There is great access all along the river from the road that takes you up to the lake. The fishing is great from just above the hot spring area you will pass on the left of the road all the way up to the dam. 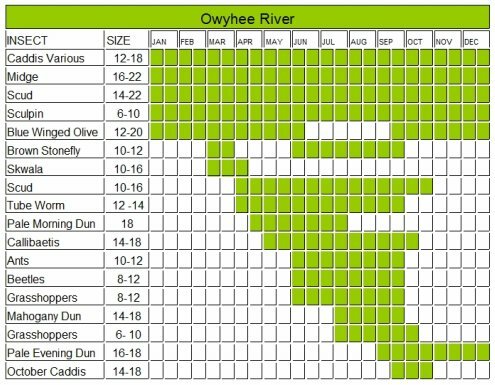 There is always lots of fly-fisherman working the river but there is about 10 miles of fishable river holding some monster Brown Trout so there is plenty of room to spread out. The nice thing about lots of fly fisherman is that it forces you to try new spots, and you always find good ones. 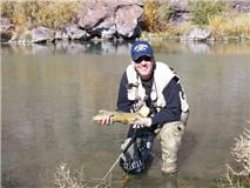 This river is catch and release only when fishing for Brown Trout, which means there will always be plenty of fish to go around. If you do catch some Rainbow you will not want to eat them. This river has a high level of mercury in the stream and eating too many fish from this river could cause problems. The river is shallow and most people wade it although there are those who like a float tube. I fish there often and 80% of the fish I catch are 18” or better but I have yet to break the 26” barrier. They are in there, and I have hooked a few of them, I just haven’t landed one yet. The fishing is year round and the quality of fishing is related to the flow levels. Once the flow levels settle into the low 200’s the river really heats up. There is a lot of moss in the Owyhee and the water has a different color about it, but the river sure feeds the fish. This is a dessert location so be sure to bring sunscreen and light gear. The temperatures in the summer on the Owyhee River can get well above 100 degreees and there is not much shade available. Typically Nymph fishing and midges will work most of the time, but when the hatch is on the fish only look up. This river has good hatches of Blue Winged Olives and Pale Morning Duns and sometimes they overlap. The fish do see a lot of insects and they know what they are looking for. You will need to have a great presentation with long leaders on some of the flat stretches of the river. I am not sure how many fish live here, but it sure seems like a lot when the hatch is on. The Brown Trout fishing is amazing! Here is a map of the Owyhee area. Leave the Owyhee River page and return to Oregon page.